Left to right: The dense forests of Tsagarada are interspersed with churches and aristocratic homes. The Bridge of Kleidonia in Zagori is the end point of the rafting route on the Voidomatis River. The bucolic landscape outside the village of Dimitsana. Pristine nature, fresh air, great food, authentic experiences and plenty of history: here are three destinations for getaways that reinvigorate body and soul. 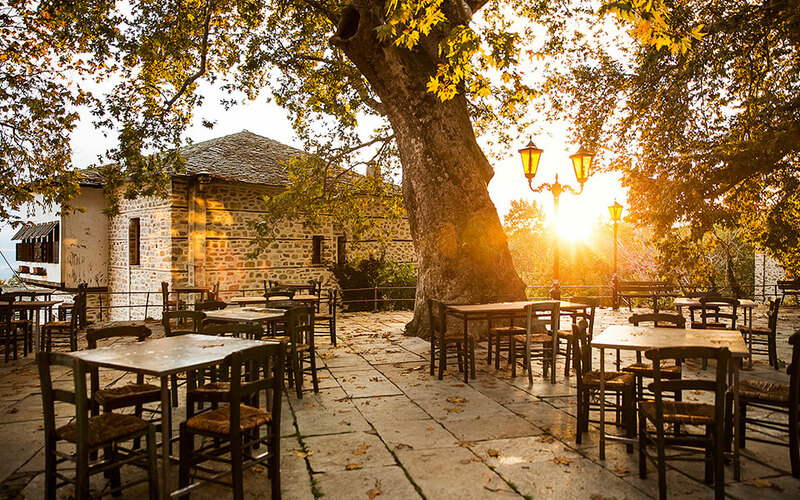 In Ioannina’s Zagorochoria region, one of Greece’s most special destinations, manmade structures like villages, bridges and cobbled streets blend harmoniously into their breathtaking natural surroundings. The path that leads to Oxia, another site with a stunning view of the Vikos Gorge. Historical background: The period from the 17th to the 19th century was of vital importance to this area. During that time, although Greece was under Ottoman rule, Zagori enjoyed a special tax status and autonomy. As a result, trade flourished, bringing the wealth that helped the area acquire its unique architectural character. Those were also the days when the renowned Vikogiatri – folk healers – used ointments (still used today) made from the therapeutic herbs of the Vikos Gorge to treat ailments. The landscape: The area features two rivers – the Voidomatis, one of the cleanest and coldest in Europe, and the fast-flowing Aoos; the imposing Mt Tymfi, many of whose peaks are over 2,000m tall; Drakolimni, one of the three alpine lakes of the Pindus mountain range, nestled at an elevation of 2,050m; and the Vikos Gorge, one of the deepest in the world (1,200m), which is complemented by the Vikaki and several other gorges. This stunning landscape – in which rocks, water and lush vegetation alternate and colors change with the seasons – is also home to dozens of stone-built traditional settlements. 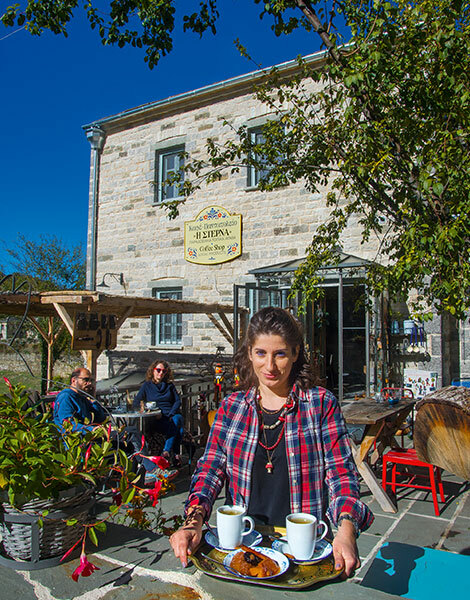 The area is at the heart of the Vikos-Aoos National Forest – a UNESCO Global Geopark – which, in turn, makes up a section of the Northern Pindus National Park. Walking by the Voidomatis River, next to the bridge of Aristi. Rafting on the gentle currents of the Voidomatis River. Climate: Heavy rains fill the streams and rivers, waters the earth and increases humidity. The winters are harsh, with a lot of snow; summers are relatively cool with intermittent rain. Until the 19th century, many of the area’s inhabitants – mainly stockbreeders – would adjust their lifestyles according to the weather, moving to the lowlands every autumn. 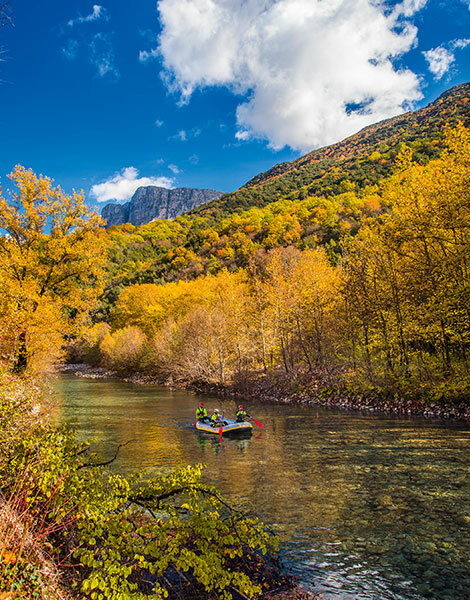 Activities: You can enjoy rafting on the Voidomatis River year-round, or on the demanding Aoos River – but this only in winter months, and only for the more experienced. There is also canyoning in the gorges, mountain biking, river trekking along the Voidomatis and snowshoeing (Trekking Hellas, Tel. +30 694.475.0009, +30 26510.717.03). 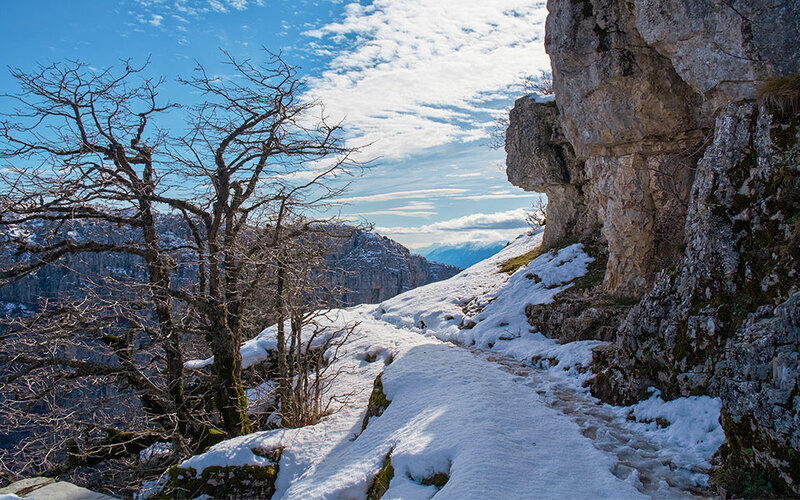 Some of the most beautiful trails in Greece (many accessible only in the summer) are located here as well, including one that runs along the Vikos Gorge and another that ascends to Lake Drakolimni, on Mt Tymfi. In the winter, you can walk around the village of Kapesovo, set out on the stone skales (stepped cobbled roads) or take the Voidomatis Trail. For yoga in nature and wellness treatments, contact the Aristi Mountain Resort (Tel. +30 26530.413.30). 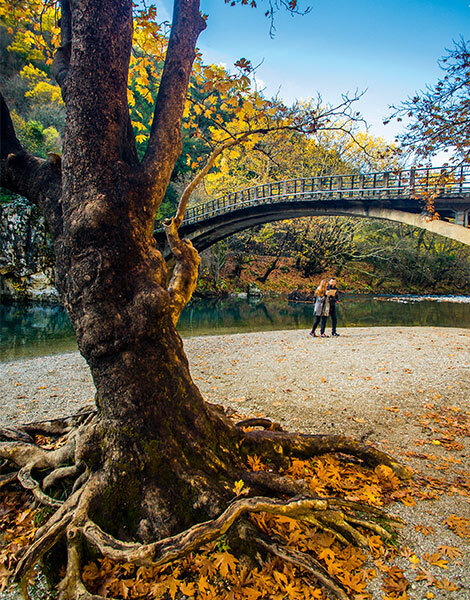 Aristi is one of the most beautiful and well-developed villages of Zagori. Beverages made with local herbs together with homemade desserts at Sterna in Megalo Papigo. Food: Local fare often includes wild mushrooms and herbs; restorative trachanas (a type of porridge) and soups; almost any kind of pie you could think of; organic vegetables from privately owned gardens; and dairy and meat products from local stockbreeders. Zagorian cuisine reflects a wise frugality that makes the most of nature’s ingredients and one’s own produce. Opt for Astra (Tel. +30 26530.421.08) in Megalo Papigo; Thoukydidis (Tel. +30 697.998.3798) in Kapesovo; or the Salvia restaurant (Tel. +30 26530.413.30) at the Aristi Mountain Resort. For local sweets and for drinks prepared from wild herbs, try Sterna in Megalo Papigo (Tel. +30 697.720.2817). Inspiration: A tour of some of the 46 Zagorian villages is a lesson in architecture. Secular buildings, mansions and churches all feature interlocking stone construction and slate roofs. Other evidence of the renowned artistry of the craftsmen of the 18th and 19th centuries are the little cobbled roads, the skales, and the exquisite stone bridges (around 100 of them) that span rivers and streams. 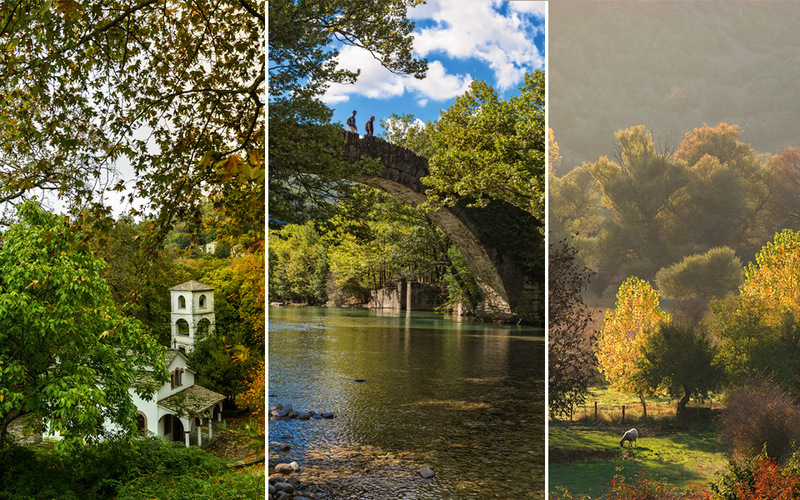 Megalo Papigo, Aristi, Kato Pedina, Kipi, Vitsa and Monodendri are some of the villages where tourism is more developed, while Dilofo, Koukouli and Kapesovo retain a more authentic charm. 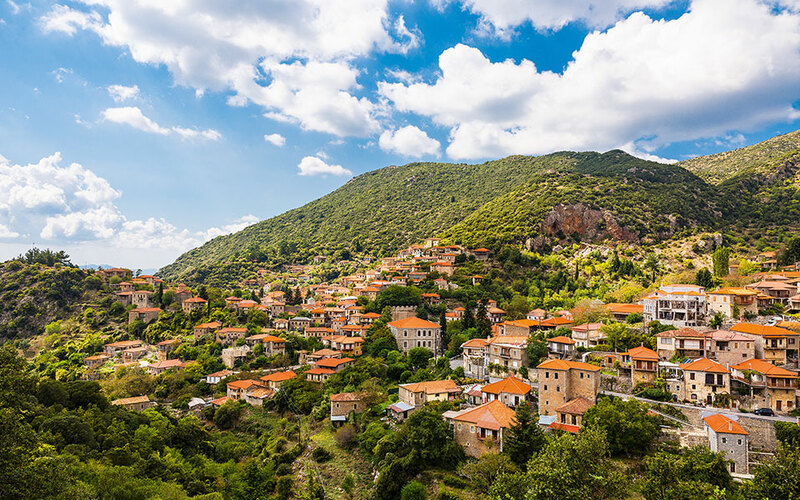 There’s so much to do in this history-packed corner of Greece: visits to significant historical monuments, hikes on Mt Mainalo or in the Lousios Gorge, strolls through stone-built villages, and more. Aristocratic Stemnitsa, surrounded by rich vegetation. Myths and history: According to myth, this was where Arcas, the primogenitor of the Arcadians, once reigned. It was in the waters of the Lousios River that the newborn Zeus bathed. The god Pan, a symbol of bucolic life who charmed intellectuals and influenced the art of the Renaissance, was worshiped in the area’s mountains as well. In antiquity, it was home to one of the most renowned asclepieia (healing sites) – that of Ancient Gortys, near the village of Karytaina. In more recent times, highland Arcadia was one of the epicenters of the 1821 War of Independence. The area produced military leaders and religious patriarchs, was the location of “underground” schools and supplied the revolutionaries with gunpowder from the 14 gunpowder mills in Dimitsana. The landscape: Mt Mainalo (1,981m), with its forest of Greek fir (Abies cephalonica) and its alpine meadows with plentiful herbs, dominates an area that includes monasteries, watermills and bridges, as well as the Lousios and Alfeios rivers, with their plane trees, olive trees and wild fruit trees. 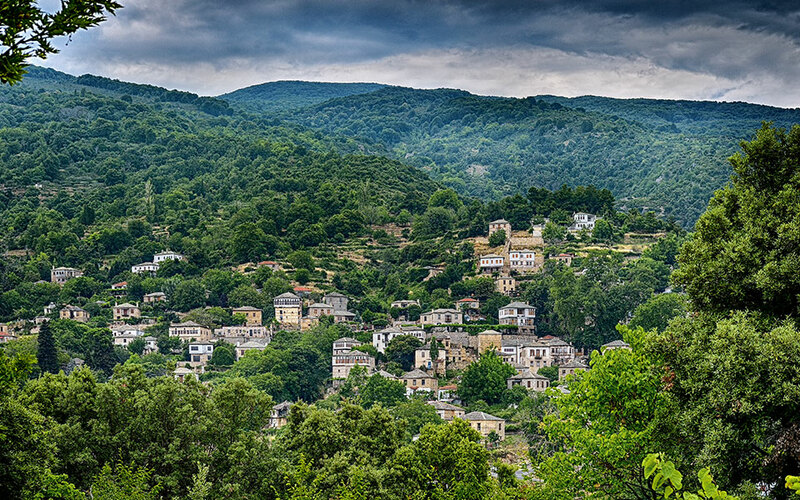 In the midst of this stand picturesque villages such as Karytaina, Stemnitsa, Dimitsana and, higher up, Vytina. 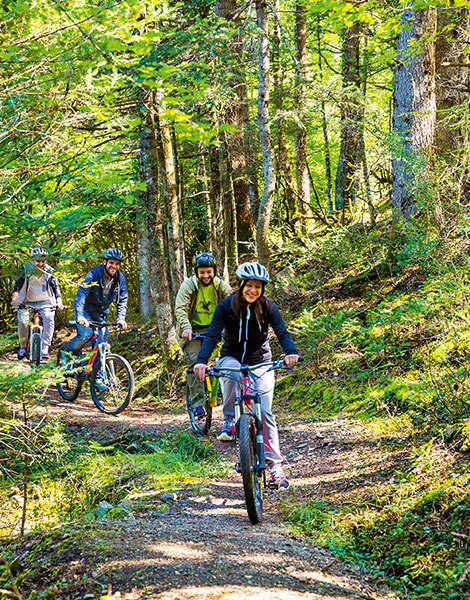 The forests around Mainalos are ideal for hiking and mountain biking. You will find choice dairy products at Tsatsouli in Vytina. Climate: Summers are cool and winters are dry but with snow; humidity is low (except in the gorges). The area constitutes an ideal environment for those with respiratory conditions. It’s no coincidence that Vytina had two functioning sanatoriums until the 1940s, and that this Arcadian resort village appeared very quickly on the tourist map. Activities: Follow the trail leading to the Lousios Gorge; it begins in Dimitsana and ends in Ancient Gortyna (Gortys), a four-hour hike. For a shorter walk, opt for the section that links the three historic monasteries of the gorge – the Nea Moni Filosofou (17th century), the ruined Palea Moni Filosofou (said to have operated as a underground school during the Greek War of Independence) and the Prodromou Monastery (16th century). More experienced hikers might want to take on the 75k Menalon Trail, certified by the European Ramblers’ Association, which runs from Stemnitsa to Lagadia. The hike takes five days to complete, with accommodation in a different village every night. Other activities in the wider area include horseback riding in Elati (Christos Simopoulos, Tel. +30 697.702.2173), rafting on the Lousios and Alfeios rivers (Trekking Hellas, Tel. +30 27910.259.78), mountain biking, ATVs and 4X4s in Vytina (Explore Mainalo, Tel. +30 693.816.9580) and skiing at the Mainalo Ski Center. 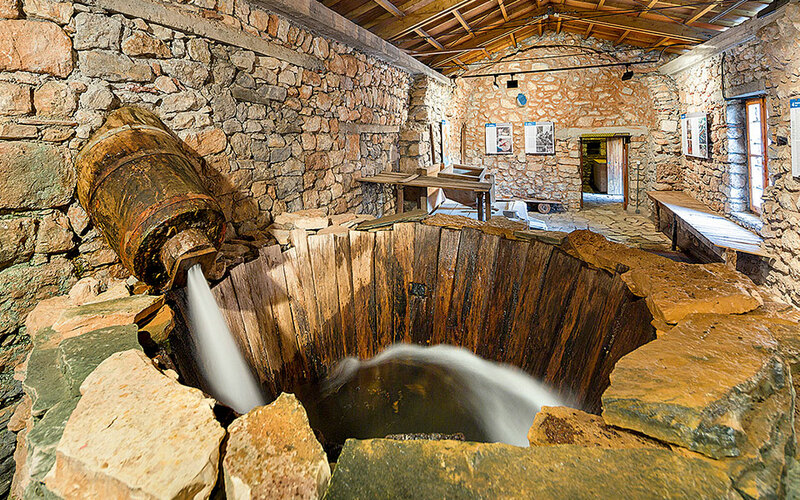 A fulling mill, an installation once used for washing textiles, at the highly educational Open-Air Water Power Museum in Dimitsana. Food: Handmade pasta, mushrooms, herbs and wild greens, local dairy products and meat are the basis of Arcadian cuisine. Try local recipes featuring products from their own farm and garden, as well as homemade bread, at the taverna Zerzova (Tel. +30 27950.317.53), located in the village of Panaghia, and at the taverna Stemnitsa (Tel. +30 27950.813.71) in the village of the same name, which also offers family-produced meats and local cheeses. 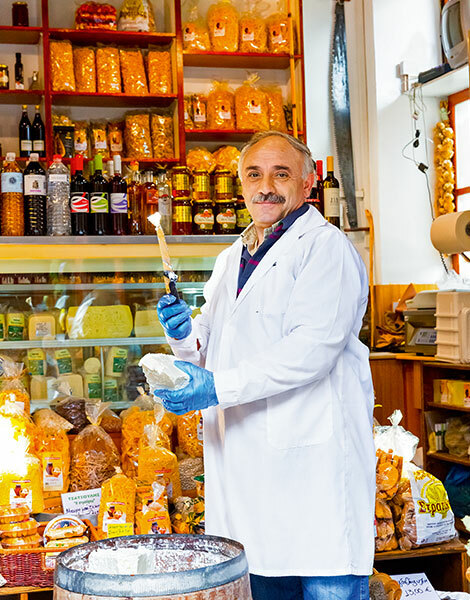 When in Vytina, shop for dairy products at Tsatsoulis, for pasta and other products at Palea Agora and go for the honey at Liaropoulos. Inspiration: The Open-Air Water Power Museum (Tel. +30 27950.316.30), on the outskirts of Dimitsana, is well worth a visit. There, you can see how a fulling mill, a flour mill, a raki still and a tannery are all powered by water. In Stemnitsa, visit the local Folklore Museum (Tel. +30 27950.812.52), which has displays on traditional homes and occupations. Stemnitsa is also the location of the Silver and Goldsmithery School (Tel. +30 27950.815.14), which organizes workshops, too. For seminars on cooking, contact the Mpelleiko guesthouse (Tel. +30 27950.812.86). In Elati, if you’re interested in workshops on painting and wood carving, call Christos Simopoulos (Tel. +30 697.702.2173). In Karytaina, take a walk around the Frankish castle and all the way to the stone bridges on the Alfeios River. No less than 70 picturesque villages and stunning settlements are yours to explore on Pilio, a mountainous peninsula with lush vegetation that runs all the way down the sea. 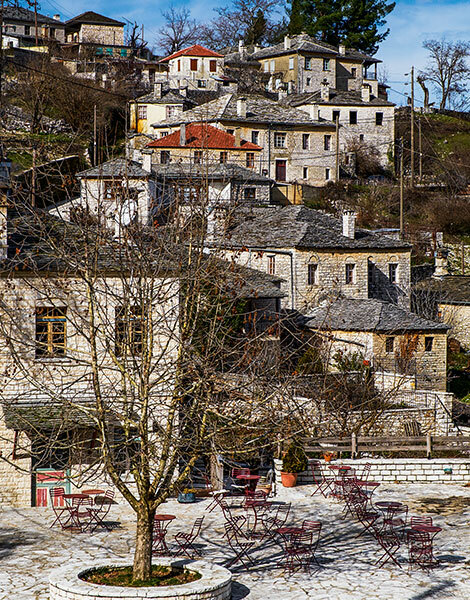 The village of Pinakates is one of the prettiest in Pilio, its small size notwithstanding. Myths and history: Mt Pilio appears in a lot of myths – and how could it not, being the summer residence of the Olympian gods and the legendary homeland of the half-man, half-horse Centaurs? The wisest – and most famous – of all of the Centaurs was Chiron, who possessed much knowledge, including much of a scientific nature. He was believed to have been a healer himself, using many of the herbs that grow on Mt Pilio to treat ailments. His list of students included Achilles, Theseus and Asclepius – the god of medicine. To this day, Chiron remains a symbol of inner peace and tranquility, and of the art of healing. The landscape: Rising between two bodies of water – the Pagasetic Gulf and the Aegean Sea – Mt Pilio occupies almost the entire northern half of the regional unit of Magnisia. Dense forests of beech, walnut, oak, chestnut and other trees compose heavenly landscapes, while views of the sea – especially from the eastern side of the mountain – are astounding. 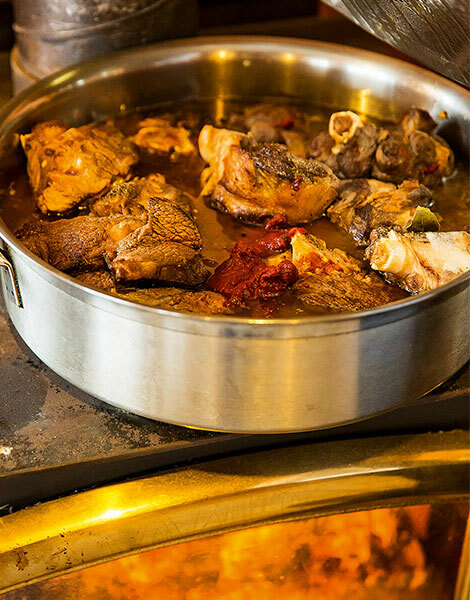 You can try stews and other dishes made with local meat in the taverna Meintani in Zagora. 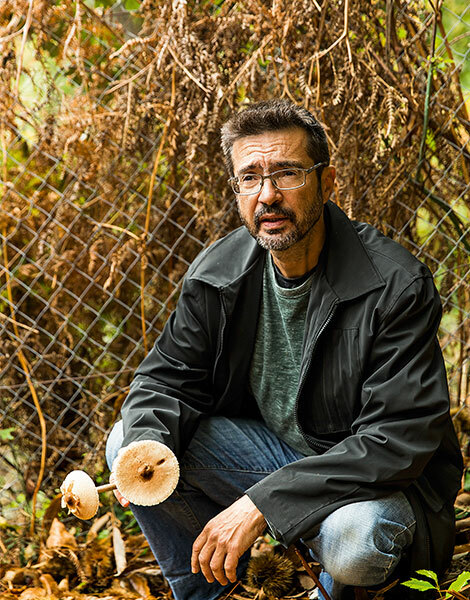 A longtime mushroom expert, Filaretos Psimenos is the owner of the guesthouse Amanita. Climate: Coastal, lowland and highland villages are all to be found on Pilio. Its most famous villages are those built highest up. Even though the mountain rises abruptly from the sea and its highest peak stands at only 1,624m, winter brings heavy snowfalls, and a ski center operates in the village of Hania. In summer, the lush vegetation keeps the area cool – but also humid. Activities: You can enjoy Pilio ‘s natural bounty while staying at the Amanita guesthouse (Tsagarada, Tel. +30 24260.497.07). Its owners have created a small organic garden in which they cultivate seasonal vegetables, fruit trees and herbs (many of them medicinal) that are representative of what grows locally. In hands-on seminars, you can get to know the herbs of Pilio and learn how they’re used in cooking. The same folk also organize forays in search of mushrooms, and teach visitors how to identify them – later, the harvest is cooked and enjoyed collectively! The whole of Pilio is hiker heaven. Be sure to walk from Damouchari Beach to Tsagarada, from Kissos to Mouresi and from there on to Aghios Ioannis. Hikes are organized by companies like Hike Away in Pelion (Tsagarada, Tel. +30 24260.497.24) and Bike or Hike (Portaria, Tel. +30 698.209.9620), which also offers cycling rides. The village square in Vyzitsa. Food: Mt Pilio is abundantly fertile and fruitful – wild mushrooms and greens, apples, walnuts and chestnuts are just some of what grows here. Head to Zagora to sample the protected designation of origin (PDO) apples grown by the agricultural cooperative Zagorin; while there, be sure to try the “honey of the Centaurs,” which is what they call the petimezi (a molasses-like syrup) they make from their apples. The taverna Paradeisos (Tel. +30 24260.492.09) in Tsagarada serves up traditional dishes prepared using local ingredients, while at the taverna Meintani (Tel. +30 24260.226.26) in Zagora you can try local greens and meats, and pies made with handmade filo pastry.